Upgrading the attendee experience: Should Automate and ProMat be a single organism? 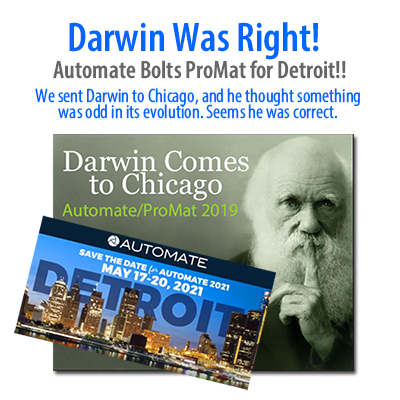 Charles Darwin attending both Automate 2019 and ProMat 2019 would have a fun-filled field day observing the natural selection process going on right before his eyes. At Automate, he’d have the distinct pleasure of watching machine vs. machine vying with each other for superiority in the factory; at ProMat he’d be able to take in the last vestiges of humans contending with machines for supremacy in the warehouse. It would be like watching the Galapagos evolution firsthand as opposed to arriving on the HMS Beagle millennia later for after-the-fact observation. Given that we are operating within the Fourth Industrial Revolution, with all the talk and money that’s being poured out on things like the Industrial Internet of Things (IIoT), and smart everything from smart factories to smart warehouses to smart supply chains, does it make sense to have a manufacturing-oriented expo and a logistics expo as separate entities? Attendees pile in through the McCormick Center’s doorways temporarily leaving behind a world where their reality is asking them for end-to-end solutions; a blisteringly fast-paced new world that wants to see raw materials and finished products as opposite ends of the same continuum. Within the McCormick Center their reality is split. Darwin might question such a duality as being at an evolutionary dead end. How, he might ask, can the advantages of AI, analytics, and intelligent automation be properly assessed by potential customers when everything as far as they eye can see is an archipelago of hundreds of islands separated from one another by carpet and signage? Why not “smart” events or even “partial” smart events? AI and digital disruption could profoundly change the event industry. Darwin might well ask if Automate 2019 and ProMat 2019 could be a “smarter organism”. The guiding objective here might be to consider if “smarter” would mean a distinct upgrade in the attendee experience of Automate and ProMat. If so, and it seems highly probable that going smart would be beneficial, then the real question is: Where is it? It’s late! For example, when will some or any of the booths at future expos have added augmented reality (AR)? Maybe an attendee at the Fetch Robotics booth might use AR to transport to a warehouse to see the Fetch Freight500 and Freight1500 bots actually on the job; a begoggled attendee might even get a shot at operating them in an AR scenario. That might be a better-quality experience for a potential buyer than watching robots on the carpet or in a video. What’s with all of those cobots wall to wall in the McCormick Center? Are we witnessing the evolution of the industrial robot? The pace of invention and innovation within the cobot space is crackling with activity and is entering into a new, rapid development phase. On the other hand, the traditional industrial robot space is not doing much of anything. Will the cobot transform the industrial robot? The cobot and the farm tractor have a lot in common as tools. The farm tractor, first introduced in Iowa by John Froelich in 1890, transformed manual farm labor into “power farming”. Farming hasn’t been the same since. The cobot, first introduced by Universal Robots in 2008 in Denmark, transformed manual manufacturing at Linatex, a Danish plastics supplier, into “automated fabrication.” Manufacturing hasn’t been the same since. Cobots have gained traction and are disrupting everything everywhere. Froelich built his tractor as an aid to harvesting. Farmers, the end users, had other ideas. Highly inventive end users of any tool, farmers quickly innovated new uses for the tractor for plowing, tilling, disking, harrowing, planting, watering, mowing, stump pulling, excavating, and even tugging an occasional wagon-full of neighbors around for a harvest hay ride. The farmer, as end user, was the driving force of transformation once the tool was placed into his hands. Today, just as farmers before them, manufacturers, as end users, are coming up with ever-newer uses for cobots, many that surprise even the cobot’s inventors. What Does This Mean for Both Organisms? We sent Darwin to Chicago to research his new book: The Origin of Tradeshows. Awesome for Detroit! The city is on the mend, and this is a super pick-me-up! But what does it say about the former Automate/ProMat cross-pollination that’s been trying to semi-merge (and still remain separate since 2011)? What has the rise of robots since 2011 meant to this rending apart of both organisms? It’s looking more and more these days like robots are disrupting material handling to the point where tradeshows like ProMat and MODEX, etc. are capitulating to robot-driven automation. That’s why we asked Darwin to check out Automate/ProMat for us. Darwin may be getting on in years, but he’s still sharp as a tack. I think we need to send Darwin to investigate more closely. Innovation around the tractor ramped up so fast and furious that another Iowan, William Galloway, was able to put together a 146-page catalog of tractor-ready implements by 1913: Galloway’s Catalog of farm implements. Tractor implements that no one had ever dreamed of previous to the tractor’s invention and introduction soon became must-haves on every farm. Mega industries sprang up to supply the ever-growing needs of “power farming”. Hiring workers—many of whom were ex-farm laborers—provided the tens of thousands needed to make and supply “power farming” implements. John Deere bought Froehlich’s company, and has done quite well in the tractor biz ever since. Another early tractor manufacturer, CL Best Tractor Company, would reform itself as Caterpillar Inc. Trillions of dollars in future industries as well as the production of food were birthed when Froehlich rolled out his first machine in Waterloo, Iowa…which is less than 300 miles west of Chicago’s McCormick Center. The cobot is on a trajectory to do the very same for manufacturing. IDC’s forecasting that by 2018 30 percent of all “new robotic deployments will be smart collaborative robots that operate three times faster than today’s robots and are safe for work around humans,” didn’t quite pan out in 2018. But there’s still time: The International Federation of Robotics forecasts the cobot market to grow from $710 million in 2018 to $12.3 billion by 2025, at a CAGR of over 50 percent. Cobots are a workforce enabler. “The face of manufacturing is evolving, becoming increasingly lean and agile,” says Dr. Jeremy Marvel, research scientist and project leader at the U.S. National Institute of Standards and Technology (NIST). If you want to chat any of this over with Darwin at what should probably be renamed AutoMat, look for him at the food court.